Colonel Dwight Randall Boggs, 48, Wright-Patterson Air Force Base, Dayton, Ohio, son of retired Chaplain Colonel U.S. Air Force William Gilmer and Peggy Jolene Boggs, China Grove, died of a heart attack on Friday (May 19, 2000). Born June 19, 1951, in Mooresville, North Carolina, Colonel Boggs was a 1973 graduate of Lenoir- Rhyne College, Hickor, North Carolina. He then attended the U.S. Air Force Officer Training School and was commissioned a Second Lieutenant. He later graduated from navigator training. Throughout his honorable and distinguished 27-year career, he flew combat operations and served in key positions including squadron commander, group commander and director of logistics, 21st Air Force. Highly decorated, he received two Commendation Medals, five Meritorious Service Medals and the Legion of Merit. Survivors, in addition to his parents, include wife Teresa J. Boggs; sisters Sydna Shaw, Springfield, Missouri, and Karen Wagner, Grafton, Virginia; and brother Lieutenant Colonel Kevin Boggs, Maxwell Air Force Base, Alabama. Funeral services will be held at Arlington National Cemetery. Memorial, 4 p.m. Sunday, St. Mark’s Lutheran Church, China Grove. 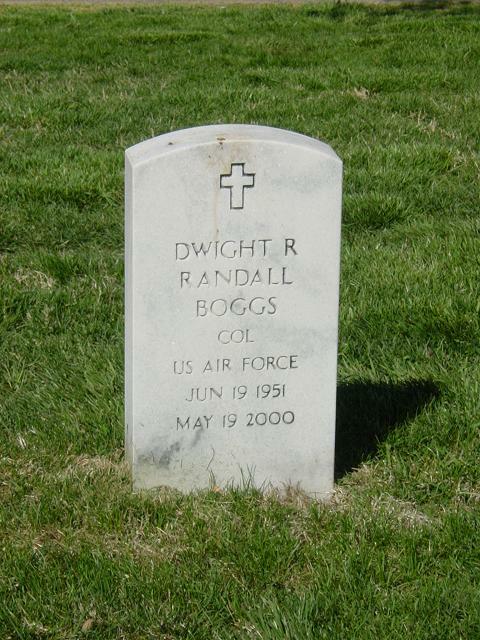 Memorials: Colonel Randall Boggs College Memorial Fund, Lenoir Rhyne College, Campus Box 7228, Hickory, N.C. 28603.